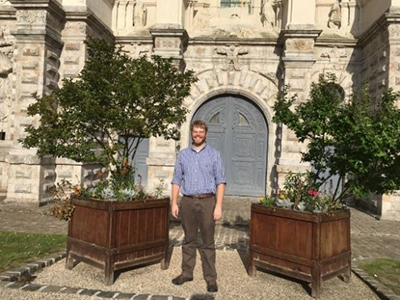 Brad Phillis, a PhD candidate in history, was awarded the 2016 Anne Marie Van Hook Memorial Travel Fellowship, which enables one student each year to conduct dissertation research abroad. Phillis spent late July and early August working on Latin manuscripts at the Bibliothèque nationale de France in Paris and the Bibliothèque municipale in Valenciennes, France. Phillis’s dissertation, “Two Murders and a Coronation: Crusade and the Counts of Flanders, 1071-1204,” analyzes the development of a crusading identity that came to characterize the counts of Flanders in the 12th century. It argues that participation in the crusading movement became the linchpin of comital claims to authority in the county. Many groups in the county—including lesser nobles who held lands from the counts, canons who served in their administrations, monks whose monasteries commemorated their deeds, and burghers who payed taxes to them—were invested in this crusading ethos. In order to investigate this local investment in the connection between counts and crusading, Phillis spent his time in the archives examining surviving books from the 12th-century library of Saint-Amand, one of the most important monasteries in the county of Flanders. One of these books is Paris, BnF, MS lat. 5129, which is perhaps the oldest surviving copy of Robert the Monk’s crusade history, the Historia Iherosolimitana. By setting this important manuscript within its bibliothecal context, Phillis is able to reconstruct the place that crusading occupied within the monastic imagination at Saint-Amand, and so to explain why comital participation in the crusades mattered to monks who would never themselves set foot in the Holy Land.